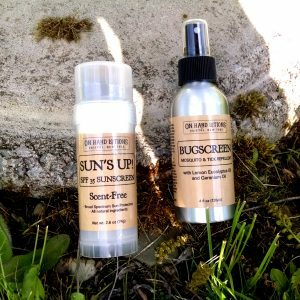 It’s sunscreen & bug spray season! Plus FAQ. Hold on to your sunhats, it’s almost summer in Upstate New York! Our gentle, natural Sun’s Up! zinc oxide sunscreens and effective Bugscreen spray have become seasonal favorites all over the United States and Australia. For more than three years our customers have relied on us to keep their skin protected so they can enjoy the beach, trails, and waterways without worry. Our bug spray really shines in the woods and around the campfire, repelling mosquitoes, ticks, gnats, and biting flies while you focus on perfecting your s’mores game. To help you get the most out our Outdoor Living items, we’ve compiled a list of our most frequently asked questions. These are based on real-life questions we hear at shows and events. What’s in the bug spray? We brew apple cider vinegar and blend it with witch hazel, oil of lemon eucalyptus, geranium oil, and other natural ingredients. The scent is herbal lemonade and the vinegar is virtually imperceptible to humans once it dries. Which insects will it repel? Bugscreen spray repels mosquitoes, ticks, gnats, and biting flies. Why do I have to shake it? Think of salad dressing: oil, vinegar, herbs. To get a consistent flavor you need to shake the dressing before pouring it on your salad. Bugscreen works the same way. Shake before you spray! Can I use it on my kids/dogs/horses/cats? Yes to kids, dogs, and horses. NO to cats. Cats lack the major phenol UDP-glucuronosyltransferase (UGT) enzymes that allow other animals to process and breakdown the components of specific oils.¹ Please do not use Bugscreen spray on cats. 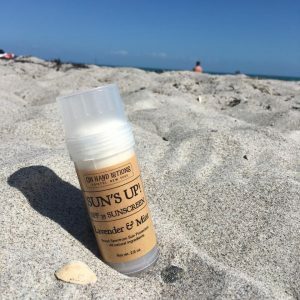 Does the sunscreen really work? Yes! All samples tested received Sun Protection Factor (SPF) ratings of 35 or greater. SPF 35 is the highest SPF rating the lab can certify at this tier. Be sure to follow application instructions (it’s really easy) for best results. Is it safe for my face? How about my kids’ faces? Yes, it is face- and kid-safe! We recommend using only the Scent Free formulation for lips, children ages six months through two years, and anyone with sensitive skin. How do I apply the sunscreen? Twist the tube to extend the sunscreen stick. 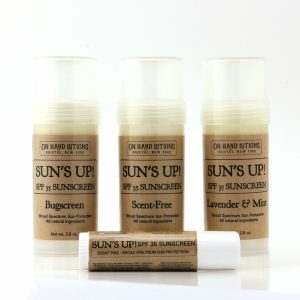 Apply the stick liberally to the skin creating a white layer of sunscreen. Rub as needed to minimize the whitened appearance. It blends in very well. Many folks tell us it is much easier to apply than the thick pastes they’ve tried elsewhere. Hope this helps you in your quest for the perfect summer staples! If you’re ready to stock up, you can order online, visit one of our many retailers around the country, or find us at several festivals and art shows throughout New York State. ¹ Court, M. H. (2013, September). Feline Drug Metabolism and Disposition, Pharmacokinetic Evidence for Species Differences and Molecular Mechanisms. Retrieved from http://www.vetsmall.theclinics.com/article/S0195-5616(13)00116-2/abstract. ² US Food and Drug Administration. Tips to Stay Safe in the Sun: From Sunscreen to Sunglasses. Retrieved from https://www.fda.gov/ForConsumers/ConsumerUpdates/ucm049090.htm.